Great for residential and commercial installation. The Zurn Z884 4.75″ wide system is designed for light traffic drainage systems with depth restrictions and a high water flow rate. The Z884 system’s smooth HDPE (polypropylene) structural composite drain channel with 3.0″[76mm] depth guarantees efficient drainage and weather resistance. Each channel section is 40 inch (3.3ft)[1016mm] long with integral top frame, interlocking ends, and radiused bottom. 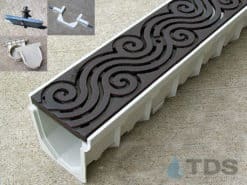 Our Z884 Driveway Drainage Kit is a great drainage solution for many residential and commercial situations. Channel is made for many years of service. 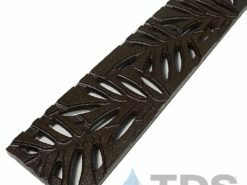 Cast iron grates are Load Class B rated for driveway traffic when installed properly. You will receive 2 grates for each section of channel ordered. Rebar stake holders are molded into the channel on sides. Channel sections lock together making your trench drain run easier to work with during installation. Grate locking devices (2 per channel) prevent the grates from moving when driven over. We currently offer kit lengths up to 200 inches (16.6ft.) long. If you are needing a longer length, you can order several kits to the length you need or contact us for a quote. We would be happy to provide one.